"Étalon" redirects here. For the French commune, see Étalon, Somme. For the reference standard, see Standard (metrology). Interference fringes, showing fine structure, from a Fabry–Pérot etalon. The source is a cooled deuterium lamp. In optics, a Fabry–Pérot interferometer (FPI) or etalon is typically made of a transparent plate with two reflecting surfaces, or two parallel highly reflecting mirrors. (Precisely, the former is an etalon and the latter is an interferometer, but the terminology is often used inconsistently.) 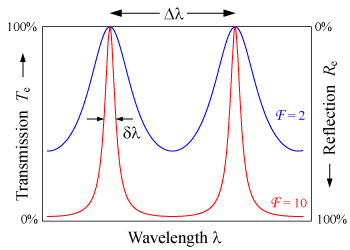 Its transmission spectrum as a function of wavelength exhibits peaks of large transmission corresponding to resonances of the etalon. It is named after Charles Fabry and Alfred Perot, who developed the instrument in 1899. Etalon is from the French étalon, meaning "measuring gauge" or "standard". Etalons are widely used in telecommunications, lasers and spectroscopy to control and measure the wavelengths of light. Recent advances in fabrication technique allow the creation of very precise tunable Fabry–Pérot interferometers. Fabry–Pérot interferometer, using a pair of partially reflective, slightly wedged optical flats. The wedge angle is highly exaggerated in this illustration; only a fraction of a degree is actually necessary to avoid ghost fringes. Low-finesse versus high-finesse images correspond to mirror reflectivities of 4% (bare glass) and 95%. The heart of the Fabry–Pérot interferometer is a pair of partially reflective glass optical flats spaced micrometers to centimeters apart, with the reflective surfaces facing each other. (Alternatively, a Fabry–Pérot etalon uses a single plate with two parallel reflecting surfaces.) The flats in an interferometer are often made in a wedge shape to prevent the rear surfaces from producing interference fringes; the rear surfaces often also have an anti-reflective coating. In a typical system, illumination is provided by a diffuse source set at the focal plane of a collimating lens. A focusing lens after the pair of flats would produce an inverted image of the source if the flats were not present; all light emitted from a point on the source is focused to a single point in the system's image plane. In the accompanying illustration, only one ray emitted from point A on the source is traced. As the ray passes through the paired flats, it is multiply reflected to produce multiple transmitted rays which are collected by the focusing lens and brought to point A' on the screen. The complete interference pattern takes the appearance of a set of concentric rings. The sharpness of the rings depends on the reflectivity of the flats. If the reflectivity is high, resulting in a high Q factor, monochromatic light produces a set of narrow bright rings against a dark background. A Fabry–Pérot interferometer with high Q is said to have high finesse. Telecommunications networks employing wavelength division multiplexing have add-drop multiplexers with banks of miniature tuned fused silica or diamond etalons. These are small iridescent cubes about 2 mm on a side, mounted in small high-precision racks. The materials are chosen to maintain stable mirror-to-mirror distances, and to keep stable frequencies even when the temperature varies. Diamond is preferred because it has greater heat conduction and still has a low coefficient of expansion. In 2005, some telecommunications equipment companies began using solid etalons that are themselves optical fibers. This eliminates most mounting, alignment and cooling difficulties. Dichroic filters are made by depositing a series of etalonic layers on an optical surface by vapor deposition. These optical filters usually have more exact reflective and pass bands than absorptive filters. When properly designed, they run cooler than absorptive filters because they can reflect unwanted wavelengths. Dichroic filters are widely used in optical equipment such as light sources, cameras, astronomical equipment, and laser systems. Optical wavemeters and some optical spectrum analyzers use Fabry–Pérot interferometers with different free spectral ranges to determine the wavelength of light with great precision. Laser resonators are often described as Fabry–Pérot resonators, although for many types of laser the reflectivity of one mirror is close to 100%, making it more similar to a Gires–Tournois interferometer. Semiconductor diode lasers sometimes use a true Fabry–Pérot geometry, due to the difficulty of coating the end facets of the chip. Quantum cascade lasers often employ Fabry-Pérot cavities to sustain lasing without the need for any facet coatings, due to the high gain of the active region. Etalons are often placed inside the laser resonator when constructing single-mode lasers. Without an etalon, a laser will generally produce light over a wavelength range corresponding to a number of cavity modes, which are similar to Fabry–Pérot modes. Inserting an etalon into the laser cavity, with well-chosen finesse and free-spectral range, can suppress all cavity modes except for one, thus changing the operation of the laser from multi-mode to single-mode. Fabry–Pérot etalons can be used to prolong the interaction length in laser absorption spectrometry, particularly cavity ring-down, techniques. 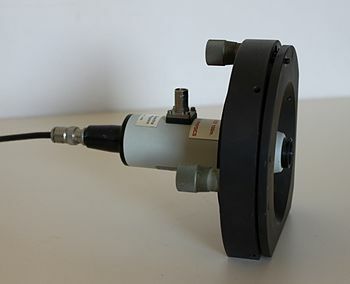 A Fabry–Pérot etalon can be used to make a spectrometer capable of observing the Zeeman effect, where the spectral lines are far too close together to distinguish with a normal spectrometer. In astronomy an etalon is used to select a single atomic transition for imaging. The most common is the H-alpha line of the sun. The Ca-K line from the sun is also commonly imaged using etalons. In gravitational wave detection, a Fabry–Pérot cavity is used to store photons for almost a millisecond while they bounce up and down between the mirrors. This increases the time a gravitational wave can interact with the light, which results in a better sensitivity at low frequencies. This principle is used by detectors such as LIGO and Virgo, which consist of a Michelson interferometer with a Fabry–Pérot cavity with a length of several kilometers in both arms. Smaller cavities, usually called mode cleaners, are used for spatial filtering and frequency stabilization of the main laser. 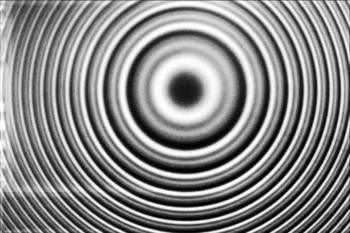 The spectral response of a Fabry-Pérot resonator is based on interference between the light launched into it and the light circulating in the resonator. Constructive interference occurs if the two beams are in phase, leading to resonant enhancement of light inside the resonator. If the two beams are out of phase, only a small portion of the launched light is stored inside the resonator. The stored, transmitted, and reflected light is spectrally modified compared to the incident light. in the resonator, one obtains the full mode spectrum of the resonator. 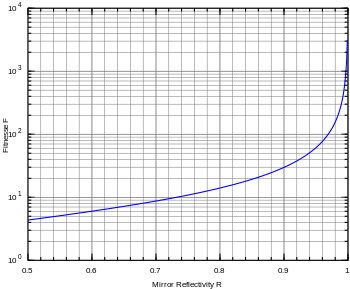 scale proportional to frequency, the spectral response of a Fabry-Pérot resonator is naturally analyzed and displayed in frequency space. The response of the Fabry-Pérot resonator to an electric field incident upon mirror 1 is described by several Airy distributions (named after the mathematician and astronomer George Biddell Airy) that quantify the light intensity in forward or backward propagation direction at different positions inside or outside the resonator with respect to either the launched or incident light intensity. The response of the Fabry-Pérot resonator is most easily derived by use of the circulating-field approach. This approach assumes a steady state and relates the various electric fields to each other (see figure "Electric fields in a Fabry-Pérot resonator").
. Light incident upon the resonator is resonantly enhanced by this factor. The index "emit" denotes Airy distributions that consider the sum of intensities emitted on both sides of the resonator. derives. However, this approach is physically misleading, because it assumes that interference takes place between the outcoupled beams after mirror 2, outside the resonator, rather than the launched and circulating beams after mirror 1, inside the resonator. Since it is interference that modifies the spectral contents, the spectral intensity distribution inside the resonator would be the same as the incident spectral intensity distribution, and no resonance enhancement would occur inside the resonator. , displayed (blue line) relative to the free spectral range in the figure "Lorentzian linewidth and finesse versus Airy linewidth and finesse of a Fabry-Pérot resonator". 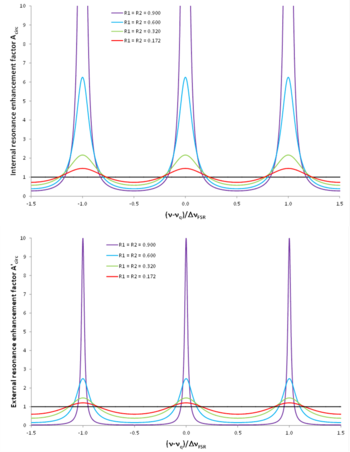 , i.e., two adjacent Lorentzian lines (dashed colored lines, only 5 lines are shown for clarity) cross at half maximum (solid black line) and the Taylor criterion for spectrally resolving two peaks in the resulting Airy distribution (solid purple line) is reached.
. 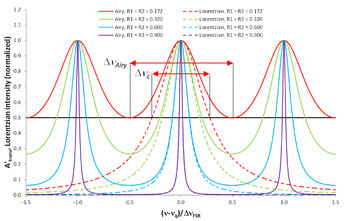 Therefore, the linewidth of the Lorentzian lines underlying the Airy distribution of a Fabry-Pérot resonator can be resolved by measuring the Airy distribution, hence its resonator losses can be spectroscopically determined, until this point. 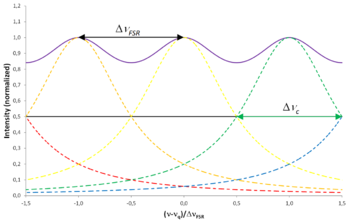 peaks can be resolved when applying the Taylor criterion.
. 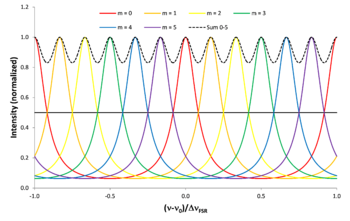 The vertical dashed lines denote the maximum of the reflectivity curve (black) and the resonance frequencies of the individual modes (colored). is displayed as the green curve in the figure "Lorentzian linewidth and finesse versus Airy linewidth and finesse of a Fabry-Pérot resonator". 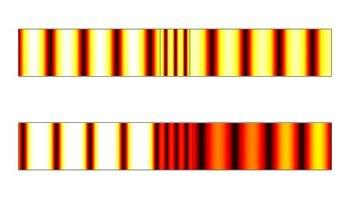 , see the figure "Lorentzian linewidth and finesse versus Airy linewidth and finesse of a Fabry-Pérot resonator".
. This approximation is then typically also used to calculate the Airy finesse. is given in the figure "Example of a Fabry-Pérot resonator with frequency-dependent mirror reflectivity". Finesse as a function of reflectivity. Very high finesse factors require highly reflective mirrors. Transient analysis of a silicon (n = 3.4) Fabry–Pérot etalon at normal incidence. The upper animation is for etalon thickness chosen to give maximum transmission while the lower animation is for thickness chosen to give minimum transmission. False color transient for a high refractive index, dielectric slab in air. The thickness/frequencies have been selected such that red (top) and blue (bottom) experience maximum transmission, whereas the green (middle) experiences minimum transmission. The varying transmission function of an etalon is caused by interference between the multiple reflections of light between the two reflecting surfaces. Constructive interference occurs if the transmitted beams are in phase, and this corresponds to a high-transmission peak of the etalon. If the transmitted beams are out-of-phase, destructive interference occurs and this corresponds to a transmission minimum. Whether the multiply reflected beams are in phase or not depends on the wavelength (λ) of the light (in vacuum), the angle the light travels through the etalon (θ), the thickness of the etalon (ℓ) and the refractive index of the material between the reflecting surfaces (n). is the coefficient of finesse. and this occurs when the path-length difference is equal to half an odd multiple of the wavelength. Etalons with high finesse show sharper transmission peaks with lower minimum transmission coefficients. In the oblique incidence case, the finesse will depend on the polarization state of the beam, since the value of "R", given by the Fresnel equations, is generally different for p and s polarizations. A Fabry–Pérot interferometer differs from a Fabry–Pérot etalon in the fact that the distance ℓ between the plates can be tuned in order to change the wavelengths at which transmission peaks occur in the interferometer. Due to the angle dependence of the transmission, the peaks can also be shifted by rotating the etalon with respect to the beam. ^ Perot frequently spelled his name with an accent—Pérot—in scientific publications, and so the name of the interferometer is commonly written with the accent. Métivier, Françoise (September–October 2006). "Jean-Baptiste Alfred Perot" (PDF). Photoniques (in French) (25). Archived from the original (pdf) on 2007-11-10. Retrieved 2007-10-02. Page 2: "Pérot ou Perot?" ^ Fabry, C; Perot, A (1899). "Theorie et applications d'une nouvelle methode de spectroscopie interferentielle". Ann. Chim. Phys. 16 (7). ^ Perot, A; Fabry, C (1899). "On the Application of Interference Phenomena to the Solution of Various Problems of Spectroscopy and Metrology". Astrophysical Journal. 9: 87. Bibcode:1899ApJ.....9...87P. doi:10.1086/140557. ^ Williams, Benjamin S. (2007). "Terahertz quantum-cascade lasers". Nature Photonics. 1 (9): 517–525. Bibcode:2007NaPho...1..517W. doi:10.1038/nphoton.2007.166. ISSN 1749-4885. ^ a b c d e f g h i j k l m n o p q r s t u v w Ismail, N.; Kores, C. C.; Geskus, D.; Pollnau, M. (2016). 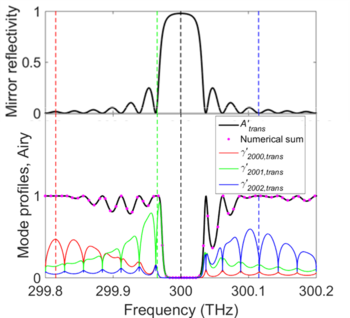 "Fabry-Pérot resonator: spectral line shapes, generic and related Airy distributions, linewidths, finesses, and performance at low or frequency-dependent reflectivity". Optics Express. 24 (15): 16366–16389. Bibcode:2016OExpr..2416366I. doi:10.1364/OE.24.016366. ^ Pollnau, M. (2018). "Counter-propagating modes in a Fabry-Pérot-type resonator". Optics Letters. 43 (20): 5033–5036. Bibcode:2018OptL...43.5033P. doi:10.1364/OL.43.005033. ^ a b A. E. Siegman, "Lasers", University Science Books, Mill Valley, California, 1986, ch. 11.3, pp. 413-428. ^ O. Svelto, "Principles of Lasers", 5th ed., Springer, New York, 2010, ch. 4.5.1, pp. 142-146. ^ Lipson, S.G.; Lipson, H.; Tannhauser, D.S. (1995). Optical Physics (3rd ed.). London: Cambridge U.P. p. 248. ISBN 0-521-06926-2. ^ Coldren, L.A.; Corzine, S.W. ; Mašanović, M.L. (2012). Diode Lasers and Photonic Integrated Circuits (2nd ed.). Hoboken, New Jersey: Wiley. p. 58. ISBN 978-0-470-48412-8. Hernandez, G. (1986). Fabry–Pérot Interferometers. Cambridge: Cambridge University Press. ISBN 0-521-32238-3.